Ryan asks Dot if she's been feeding Bouncer at all; they've had a lot of strange items show up on their doorstep recently, the latest exhibit being a slipper. Dorothy admits that she may have been spoiling him a bit since he found her bone for her. Gemma arrives enquiring as to whether they have seen Sky about. Dot admits they haven't, but they'll help her look. Over at road, Madge is frantically looking for Sky too. Talking things through with Helen double checks all the possible options, and instructs Madge to check the back garden once more. She admits the situation doesn't look good given the latest events with Eric. Madge asks if they'd be able to check further afield in the car. Arriving home from work, Doug is pestered by Harold after any news on Sky. He admits he hasn't seen her, but will keep a look out. Reading through the statements for the press, Paul realises that their latest secretary is no better. 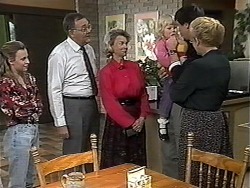 Caroline offers to get someone new in for the morning, but Paul admits they don't have the time; their deadline is 10am. Caroline suggests they get reception to do it in the morning, but Paul points out they are already short staffed, and asks if she'd be willing to do it. Pointing out it's not her job, she suggests he does it himself or re-hire Melanie. Admitting that he can't afford Melanie, Chrissie offers to help out, though she expects a half day off in return. 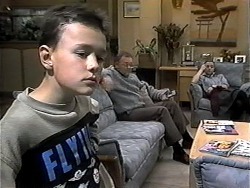 Joe pops home to find Toby sitting on the sofa, pointing out that they already have all the bases covered, Toby admits he doesn't know how to help. Joe decides that it's probably better that he stays put anyway, as he doesn't want two kids lost, and informs his son he'll be back as soon as they find Sky. Joe heads off, leaving Toby alone again. Still no luck with the hunt for Sky, Ryan wonders if he should help, but Dot suggests the he should get on and work. Besides she thinks Sky may have gone further away by now, having possibly been taken. 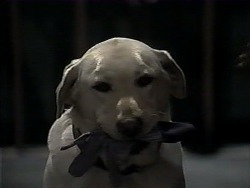 Bouncer arrives with yet another 'gift' for Dot, this time a gardening glove. Madge and Helen arrive back from their drive having had no luck. Reckoning it's been long enough, Madge decides to call the police. However young Sky tots in from the garden, complete with teddy bear, and they realise she must've been hiding in the shed all that time. Harold admits he looked in there, but given how much junk they have in the shed, she must've been hiding. Joe arrives back and is pleased to see his daughter. Giving her a hug, he jokes that he'll have to keep a closer eye on her from now on. Next morning, Joe brings Sky around for Madge to babysit. He asks if she can do him a favour and look after Toby after school as well, he wants to go and meet a top class solicitor regarding the custody case. Paul and Caroline arrive to find Christina hard at work. She informs Paul that she's almost finished the press print, for which he is grateful. Wondering who he's going to have as his receptionist for the day, Caroline points out the only person they have to hand is Linda from reception. Chrissie offers to help out, which Paul accepts, though Caroline isn't so sure. Returning home from school, Ryan is surprised to see Dot outside with a box of goodies. It turns out they are all the items Bouncer has been delivering to her. Spotting Doug pull up in his van, she returns his gardening tools to him, and enquires over a rather fancy colourful pair of men's boxers. Doug claims they are not his, but it would seem they belong to Harold who has spotted them from across the street and comes across to claim them, before disappearing back home again. 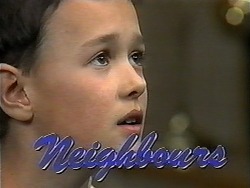 Puzzled as to why his dad isn't home yet, Madge informs Toby that Joe is going to meet someone but will be back later. 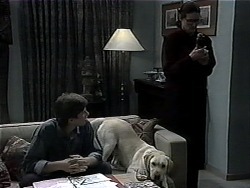 Harold arrives home and expresses his disappointment in people's abilities to train dogs, eventually revealing that Bouncer took his underwear. Madge just finds it amusing. Chrissie is on the phone asking Mel about the location of a file. Thankfully she is able to find the folder just as Paul comes through to collect it. Enquiring after the letters she's typing, Chrissie informs him that she's just finishing, but once he's returned to the office, gives Linda a call to find out if the letters have been typed. Asking for another favour, Chrissie is stumped once more and forced to call Mel again. Returning some of Bouncer's items to Helen, Helen is impressed by Dot's detective skills. Wondering if she'll be able to identify any of the other items, Dot supposes the teddy must belong to Melanie, whilst the hairbrush must be the twins, Caroline and Christina. Picking up a broach, Dot decides the tackiness must indicate it being Madge's. Helen points out that it actually belonged to her mother and was considered jewellery of the time. Toby begins to get impatient about Joe again. 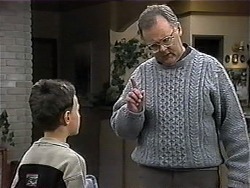 Harold tries to distract him with television, and suggests they get some food to snack on. Madge however thinks they should invite him to stay for dinner, but Toby wants to wait for Joe before they eat. Gemma helps out by offering to play a board game with him. Caroline returns to the office, surprised to see her sister still working hard. Chrissie admits she's trying to do the best she can. 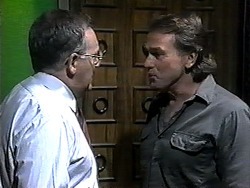 Paul appears out the office, and comments as to how much more efficient Chrissie is compared to how Mel was. Offering to give them a lift home, the girls decline, admitting they've still both got work to do. Picking up the phone again, Chrissie asks Mel if she can pop over later this evening to learn how to do the accounts. Dot receives yet another gift from Bouncer, this time a toy model. 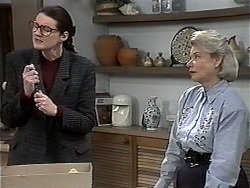 Ryan suggests that maybe she should just take everything down to a car boot sale, but Dot points out that that would be theft, as the items don't belong to her. It does however give her an idea to give the neighbours an opportunity to come and claim the items for themselves. Continuing to get more impatient, Toby refuses to come and eat dinner until Joe returns. Madge and Harold try to explain that Joe will turn up, but Toby isn't convinced, pointing out that his dad always calls if he's going to be late, even if he's just at the pub. He wonders what they are hiding from him, and if his dad will show up at all.